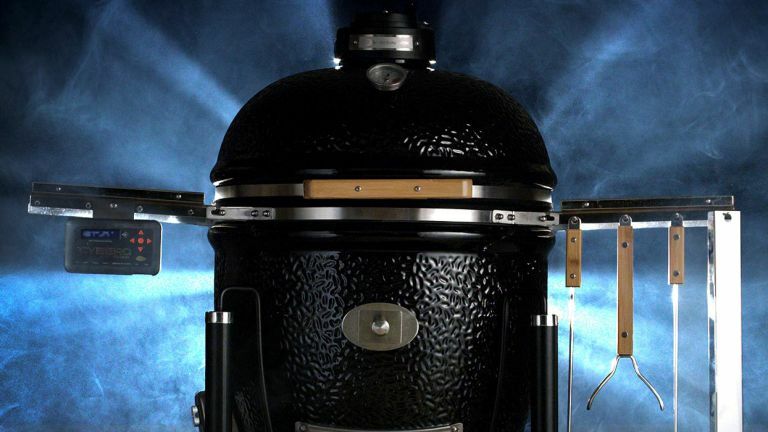 Charcoal barbecues may seem like the least techy way to cook food imaginable, essentially remaining unchanged since man invented fire, but the latest development from BBQ Guru adds smartphone integration and even voice control to cooking with red hot embers. The Monolith has CyberQ Cloud built in, which gives you the ability to control the temperature of the BBQ from your smartphone, tablet, or PC. It'll even notify you when your food it done with a text message, giving you the freedom to entertain your guests while the BBQ automatically regulates its temperature. That's not all, though, because with Alexa integration you can ask questions like, “Alexa, ask CyberQ Cloud, what is the temperature of food 1?”. The Monolith can keep track of three separate foods, so that's your sausages, burgers, and lamb kababs taken care of. If you're really into barbecuing, you can track and graph your cooking temperatures, and automatically share your cooks on social media. The Monolith BBQ Guru edition really is a complete outdoor kitchen, with over 12 included accessories, multiple cooking modes, and an incredibly fuel efficient design. It includes everything you need to get up and running, apart from some decent weather. Prices start at $1,144 (around £865) but before buying you should also check out T3's BBQ buying guide.